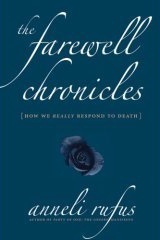 This page features excerpts from the pages of The Farewell Chronicles. When you lose someone, you have joined a club without meaning to. It is a vast worldwide society whose members share no privileges, no solidarity, no secret handshakes, no discounts at Legoland. You are just in. And once you're in, you can't rescind your membership. And you can never get out. Initiation took you by surprise. It was hellish or muted, and now what? Passing each other on the street, side by side on the subway, members of this club do not know each other for what they are, and don't even look up. You're in a club, a cruel club, because you belong yet you're on your own. You were not warned. You were not taught. No one ever sat you down and told you: some deaths, someday, will make you sigh with bittersweet relief. Others will make you think you caused them. You will say It's my fault. Sometimes regret will spin you in an everlasting lonely oxygenless orbit. No one ever sat you down and said: Some deaths will horrify you. Some deaths will make you think you hate the dead one, while others will make you think you hate yourself. Still others will make you think you hate everyone alive. No one sat you down and said: Hark. Mind what you do. Words left unspoken in life cannot be said to the dead nor can what has been said be taken back. There are such things as never and forever and too late. No one warned you about wouldhave couldhave shouldhave, singsonging in your head. No one told you to picture yourself greedy, scrambling for the leavings of the dead. They never said some deaths would shame you. Some would make you selfish. No one ever warned you that some deaths would silence you, as if you had come to live at the bottom of a well. They never said that death does funny things to love, and love does funny things to death. Death pulls out the stops, yanks off the gloves. Death shatters fantasy and hope. And all you wished to say or do, and all you wished to fix or solve for good or ill, mercies you sought, are snatched away with that last breath. And all your would-haves vaporize. And all the king's horses, and all the king's men -- too late, you say. Too late. If you had seen me in the days after my father died, you never would have known this most salient fact about me. The ancient Scythians slashed their noses and ears and slashed their hands with arrows to show that they were in mourning. We do not. No one passing us in the supermarket aisle has a clue. Living in a sparkly clean culture that exalts happiness and health, one is reluctant to bum others out. If others cannot tell by looking at you that condolences are called for, they will hardly volunteer. Translating a life into words flattens it, coarsens it, like all translations. At times like that, your voice is not up to the task and resembles a car backfiring or the braying of a mule. At times like that, talking becomes a brute bodily function not unlike sneezing, or gas. When you torment others while they are alive, the last thing you imagine is that they will die before you can ask them for forgiveness. Feel something, you implore yourself, terrified, because this was someone you knew, someone who knew you. But you cannot. A life has ended and you sit as unmoved as a tumulus. Death is a truth serum. When we are together and alive, we walk and talk and laugh and seem to love, but also, without even knowing it, we lie. When sorrow starts to ebb, you ask yourself: What sort of monster must I be to have forgotten for an hour, a day, a week? To sit here swinging my feet, eating this hamburger? In the wake of a death, the horizon around you is forever altered. Even with six and a half billion souls swarming across it, you can tell. And in that sudden absence, you seem to take up so much more space. But you are not sure what to do with it. This extra space does not feel like a luxury. In its stillness and silence your every gesture feels grotesque, like Baby Huey waddling around in sheet-sized diapers, or like Alice in Wonderland, who after tasting a strange cake felt herself lengthening like the largest telescope that ever was, growing so huge that she could no longer see her feet, and wept gallons of tears, until there was a large pool all around her, about four inches deep and reaching half down the hall. In your newly emptied landscape, you are enormous, your voice a foghorn. Your pain and fear are encyclopedic, your needs panoramic. Others will not recognize you now. But did they ever, really? They cannot follow you here. To your new land of miracles. This land of scars. Look upon whomever -- stranger, in-law, friend -- and ask him with your eyes: Hey, having fun? Enjoying that dip in the hot tub, are you? My dad would enjoy a dip too, but he can't because he's dead! Have dinner plans, eh? Live it up, live guy!